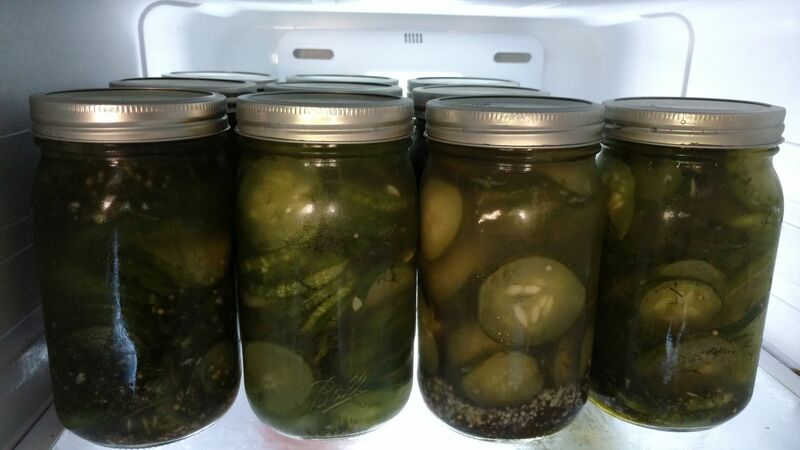 Yesterday I made 18lbs of pickles using 9lbs of cucumbers from the garden and wrote a post about it. Today I decided to move them to jars, and see if I could seal them with the vacuum sealer. First, I put them all into jars. I decided to do this in my workshop, because cleanup would be a lot easier than in the kitchen. Of course I used fresh utensils and clean jars when doing so. 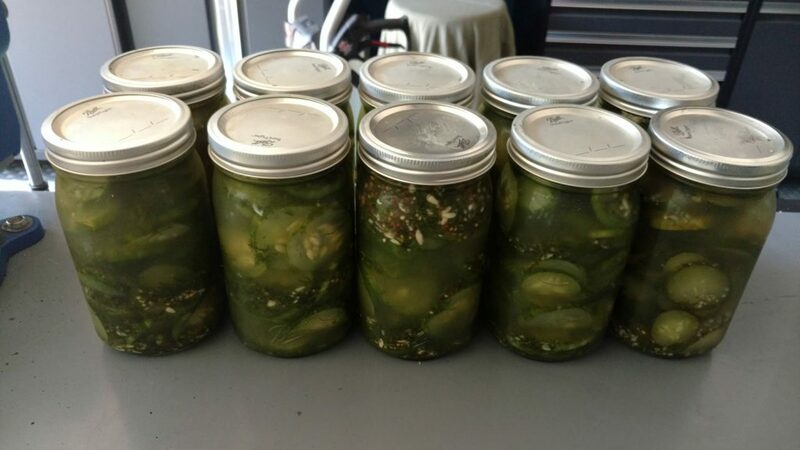 It took ten quart sized jars, filled to the brim, to contain them. The ones I filled from near the bottom of the bags tended to have a lot more of the seeds and dill pieces in them, those are probably going to be the best ones. The one in the front center has tons of the flavorful seeds and such in it. I tried to mix them up well, but they still tended to settle near the bottom of the bag pretty quickly. These jars have traditional two piece lids, where you have the actual lid and a band that screws on to hold it down. You typically boil the jars with the lids on and band loose for ten minutes or so to create a proper seal. You know the seal is good when the lid no longer moves and is sucked down onto the jar – allowing you to remove the band completely, and still have to pry the lid to get it off. Another way, though possibly not as good, is to put them in a chamber vacuum sealer and do the same process. Unfortunately, these jars are too tall to fit in mind and close the hood, so I decided to try laying them down. I added the lid and tightened the bands until the jars only had a slow drip when laid on their sides. Then, on a bed of paper towels, I vacuumed two jars at a time to remove the air and create a seal. Each jar seemed to create a good enough seal to prevent the lid from moving or being easily removed, even without the bands. Now they’re in the fridge for storage, and should last a lot longer than they would have otherwise.